Honestly, I didn’t expect that to work. But it did. We are a kitschy mobile food truck serving up the finest melt in your mouth classic grilled cheese sandwiches. I don’t know about anyone else, but I love grilled cheese. And I especially love when someone else makes grilled cheese for me. So imagine my glee when, while checking Twitter Friday night, I saw that Ruthie’s would be setting up the next day in front of Bank of Texas on Hillcrest, presumably to entice all the folks at SMU for the UTEP game. Bonus: Bank of Texas is about three blocks from my apartment, and it’s right next to 7-Eleven, which meant that not only could I finally sample a long-coveted Ruthie’s grilled cheese, but I could chase it down with my favorite beverage. Whoever wrote the description for Ruthie’s definitely hit the nail on the head. 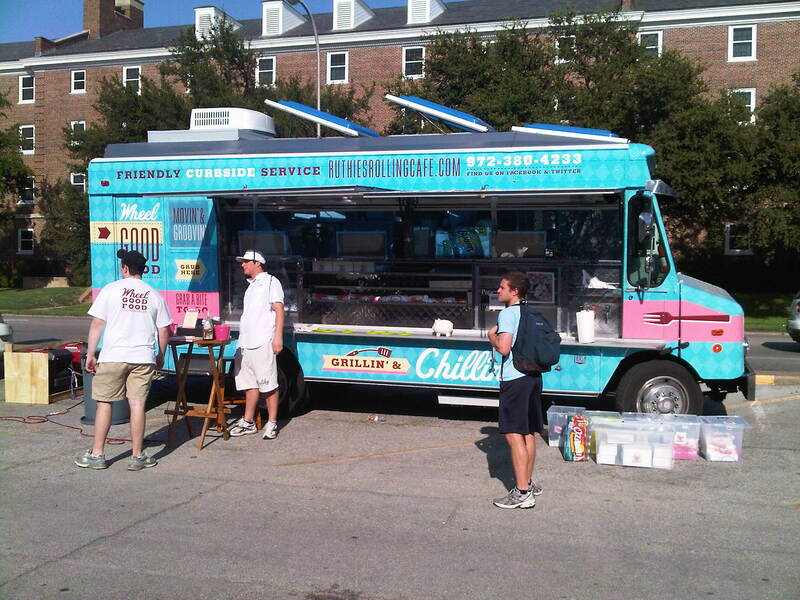 Kitschy mobile food truck, classic grilled cheese sandwiches. Pick some bread, meat, cheese, and sauce, and get a tasty grilled cheese in return, all for $7.50. Plus chips and a pickle. And I definitely liked the ordering process–they’ve made pre-printed order slips on which you select your sandwich options. I still had trouble deciding, but that’s probably just because I’m indecisive. So I went with what I know: ham, swiss, and mayo on sourdough, and for the sake of trying something new, caramelized onions. JT got cheddar, bacon, and caramelized onions on sourdough, with Secret Slob Sauce. What exactly is Secret Slob Sauce? Well…the guy told me…but then I forgot. But I do remember him mentioning honey. Whatever is in it, JT loved it. Unfortunately–and I’m a little embarrassed by this–I forgot to take a picture of my sandwich. I was way too distracted with actually eating it. And how was it, you ask? Generally speaking, it was definitely tasty. But I expected it to be tasty, so I wasn’t necessarily surprised by that. The bread was a little too crunchy for my liking, which I bet I could avoid next time by asking for a slightly less grilled sandwich. The swiss was perfectly melted and gooey, and there was *gasp* actually a considerable amount of mayo! I really hate it when there’s not enough sauce on a sandwich. Thank you, Ruthie’s Rolling Cafe, for actually using enough mayonnaise so that I could enjoy it with each bite of my tasty sandwich. JT was more than pleased with his order, which leads me to believe that perhaps I should have ordered something a little braver than ham and swiss with mayo. Something breakfast-y. Sure, there’s the standard egg/cheese/bacon sandwich, but what about something with a French toast twist, or a new take on blintzes? Perhaps even waffles? I’m thinking something fruity, syrupy, and bready. I am definitely a fan of Ruthie’s Rolling Cafe, and I think everyone else should be, too. (And I’m not just saying that because I scored a free tshirt.) Food trucks have only just begun to catch on in Dallas, which is making permits pretty difficult to get, so as of now Ruthie’s is running a very limited schedule. However, if you need something catered, they’ll do that now. Website? -Ish. Looks like their site is ready to launch, but the only info on there right now is a few links to Facebook and Twitter, as well as a phone number. Foursquare? 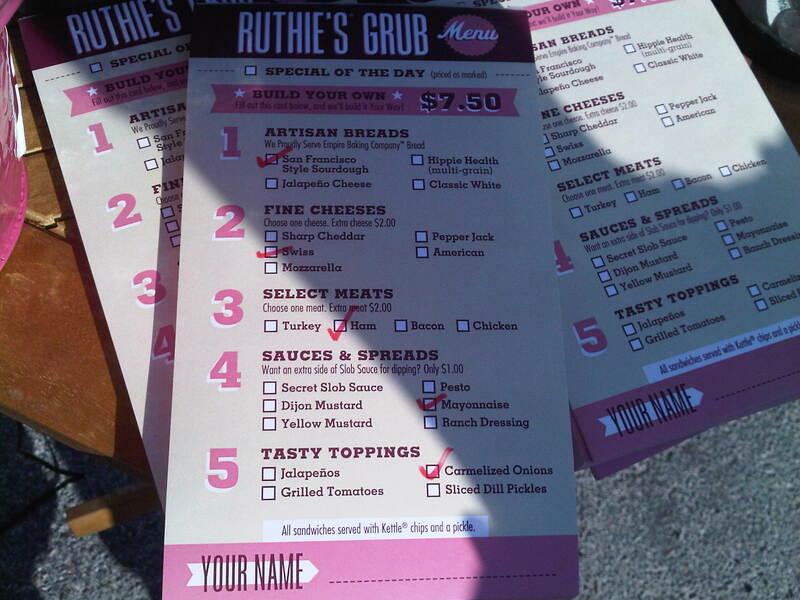 I tried to check into Ruthie’s on Foursquare, only to find that they hadn’t created a venue. So I took care of that. Someone might want to claim the venue soon. mmmm….I am TOTALLY craving a grilled cheese right now!! Your own post offers verified useful to me. It’s extremely informative and you’re simply clearly extremely experienced in this area. You get popped my sight to varying views on this kind of matter using intriguing, notable and strong written content.